Totally not gonna lie here, this is a repost from last year! The week following Christmas needs great appetizers for those that make food for New Years parties, and even smaller gatherings. I’m making these again this year, and you all know I am on vacation for a couple of weeks, so it seemed fitting ot repost these for you to enjoy again! Have a glorious, safe, and Happy New Years friends! I hope it blesses each one of you with all good and wonderful things. I’ll be back in a week or so, just in time to get started on my third year with ABC’S KATU AM Northwest! Disclosure: This is a compensated post in collaboration with Wine Sisterhood. As usual all opinions are my own. He is so right, cheese and bacon in fancy form, with a beautiful bottle of pink bubbly. What more could you ask for to end the year? Pink bubbly is my favorite New Years drink, so when I had to come up with an appetizer around my fave bubbles, it really was not too difficult. And I mean come on, pairing with bubbles in the kitchen is a treat if I must admit. It’s a gorgeous bottle of Glamour Girl Bubbly Sweet Pink Wine from Wine Sisterhood. A company I was fortunate to meet at The Big Potluck Food Blogger Conference a couple of years ago. I love making appetizers just as much as entrees. I make them into meals for myself with leftovers, or if you simply want to eat a bit less, appetizers are the way to go. Making bite sized savory treats for you, your family, or party guests is a home run. Fry cheese and well, be sure you like these people, because they will always want to come to your house for dinner. 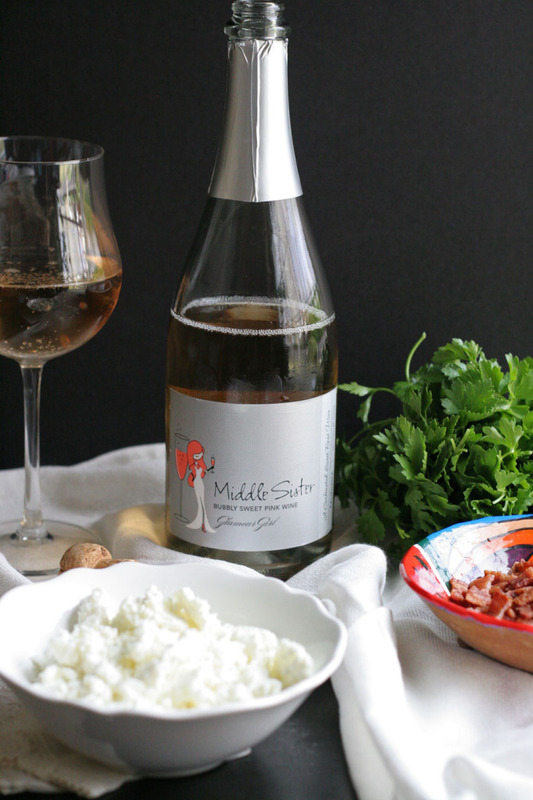 Then there is goat cheese, which pairs perfectly with the slight sweetness of the pink bubbly. It’s creamy, tangy, and salty, so adding the texture of bubbles, and sweetness makes it a dream pair. Bacon. Does that need an explanation? Ok fine, salty and sweet anyone?!!! It is the best paring that exists. So, salty bacon or any ham loves a sweeter wine, they make a fine flavor match. But with all that richness, I need something fresh and so will your guests. Making a simple five minutes arugula greens blend rounds it out perfectly. Now you can sit back with your beautiful glass of pink bubbly in one hand, a fried goat cheese bacon ball in the other and count your 2014 blessings! It has been an incredible year for me personally and professionally. Especially working with awesome companies like, Wine Sisterhood, so you better believe I’ll be sitting right there with you sipping on this lovely wine, enjoying every last drop. I love their site and company, they make wine easy and paring it even easier. Check it out! 1. In a medium bowl combine goat cheese, bacon, parsley. Mix well to combine using a fork or hands. Form balls about 2 inch in diameter. Place on parchment lined baking sheet. Place panko bread crumbs in a shallow small bowl, add 1/2 teaspoon salt, toss to combine. Whisk eggs into a small bowl. 2. Place about 2 inches of frying oil in a 10 inch skillet over medium high heat. Test oil is hot by adding a sprinkle of panko bread crumbs. If the oil is hot enough it will sizzle, if not, heat longer. Keep heat at about medium while frying. 4. While balls cool, add olive oil, vinegar, pinch salt and pepper to a jar with lid. Shake until combined. Add to the greens, toss to combine. Place greens mixture in a medium bowl, and place croquettes on top. Serve using tongs, so guests can grab as many or as little greens as they’d like. Or eat it as a salad! Serve with Pink Bubbly! Fried goat cheese AND bacon? OMG, YUM! A perfect pairing with the bubbly too. I wish I was having this for dinner tonight! Warm goat cheese and a glass of bubbly? Yes, please I’ll have it all! YES! You can have it all :). These are a delicious appetizer idea for the holidays. I love the pairing with the bubbly! These sound terrific! So flavorful! Anything with goat cheese is heaven to me. Especially when crispy and melty and creamy like in these croquettes! You rascal! These are amazing and nothing would go better with this pink bubbly than your recipe! Anything fried is good (at least that is my motto lol). 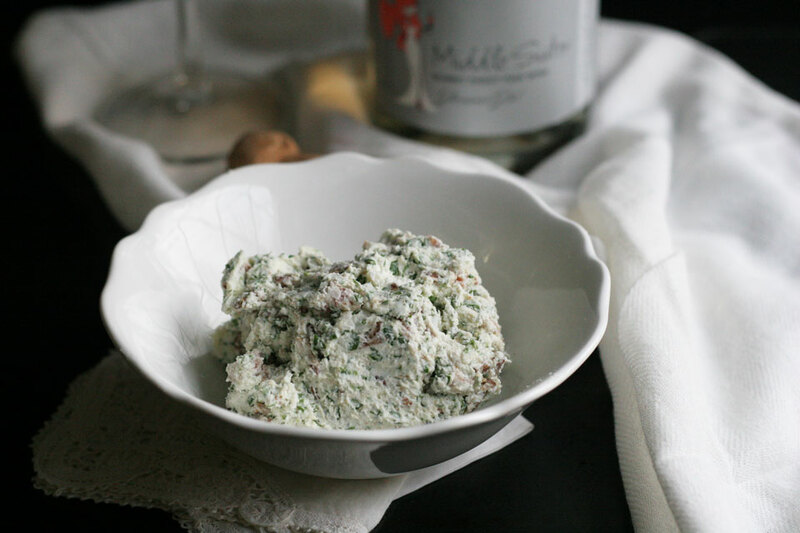 I know a lot of people that love goat cheese so this would be a BIG hit here! These look super dangerous! I’d easily polish off the whole plate! I have a soft spot for anything with the word “croquette” in it. My host family in Spain would make the most amazing ones ever when I lived there and any time I see them I think of that time. These win though with goat cheese + bacon! Awe, that is so cool. I can relate to the feeling. I grew up in Mexico and my family is from Spain, so it hits the spot when I make croquettes. Thank you! Bubbly wine is my jam! 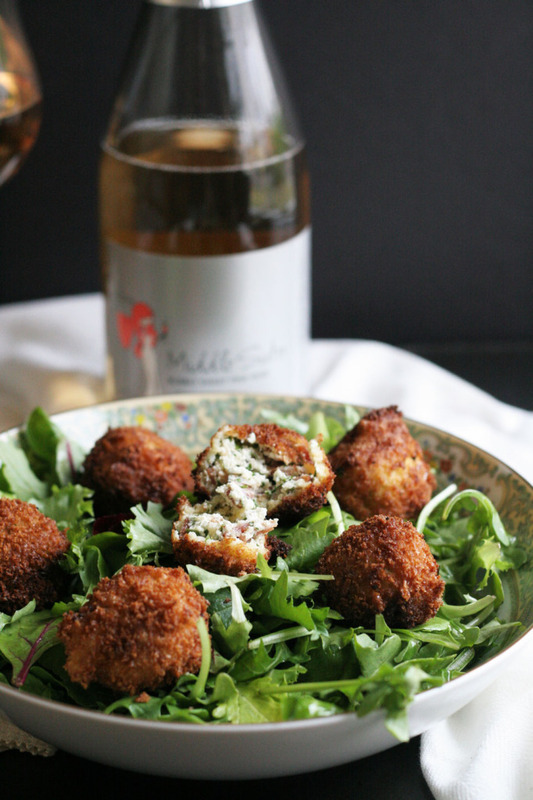 It pairs perfectly with these little goat cheese croquettes. This is right up my alley! So delicious! YES please! 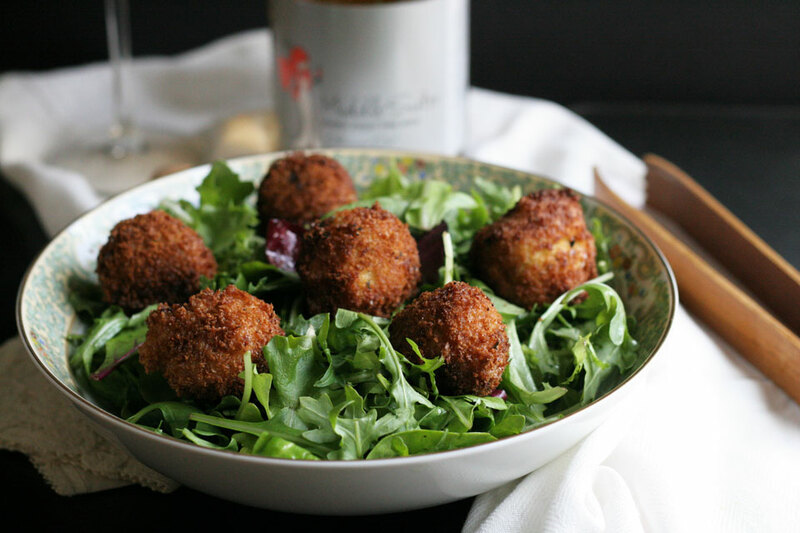 Yes, to the croquettes and yes to WINE! Perfect combo. What a perfect pairing! 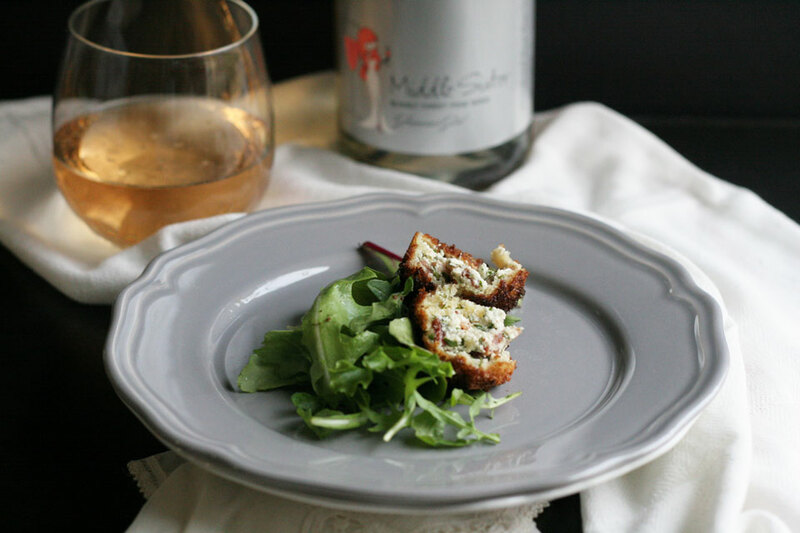 I just love savory bites like this with bubbly – how perfect for the New Year! Woah…I’m coming to YOUR house for cheese croquettes and bubbly! I’ve never tried making croquettes but they do look fabulous! love these. They would really take a salad to the next level! Always a chance to sneak in greens with the fried foods! Thank you.